HRD attestation is mandatory to legalize educational documents in foreign countries. Anyone who plans to move to another country for higher studies or employment required to have HRD attestation from the respective state HRD. Delhi HRD attestation is mandatory for anyone who has completed their studies from government recognized universities and schools in Delhi. The attestation is done only for government approved (UGC/AICTE/NCERT) educational documents. Educational certificate attestation is done by Delhi HRD department. It is done only for educational certificates issued by government recognized Delhi universities and schools. Delhi HRD attestation is needed when you apply for admissions in foreign universities and schools. In order to get admission, you have to provide attested degree certificates to prove the authenticity of the documents. 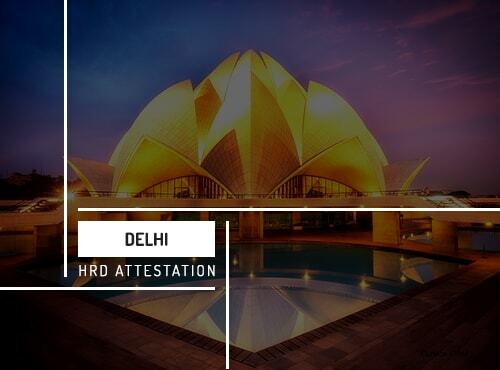 Delhi HRD attestation is also required for employment verification in foreign countries. In some countries, it is mandatory to submit the attested educational certificates for higher studies or employment purposes. Urogulf helps to make your Delhi HRD attestation process smooth and secure. When you hire us for attestation process, you can sit and relax while we do the entire procedure for you. If you are a non-resident of Delhi, there is no need for you to travel to Delhi for attestation process. We help you to have a quick and hassle-free HRD attestation. All you have to do is submit the certificates in your nearby Urogulf office. We will complete the procedure without any hassle. You can track the progress and status of your documents through our website. Contact your nearby Urogulf office in Delhi to know more about HRD attestation process.